THE future of Britain is at a crossroads and there is no doubt that tomorrow’s general election is the most important we have witnessed in decades. The result may change the direction of our nation – and the consequences of that could be felt for many, many years to come. SNP leader Nicola Sturgeon has emerged with great credit. 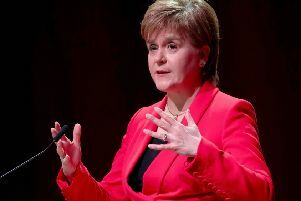 A polished performer – battle-hardened from the referendum – she has proved to be the most competent of all the leaders on the national stage, effortlessly tackling questions from all sides. She appeals to men and woman, young and old and has a calmness and credibility that is unmatched by the likes of Ed Miliband. While no-one doubts that Sturgeon believes what she is saying, Miliband has at times looked over-coached. A man who is trying too hard. The biggest compliment that Sturgeon can be given is that no-one has missed former leader Alex Salmond at this election – the supposedly irreplaceable big beast of the SNP. Never have we faced so many mainstream choices: SNP, Labour, Liberal Democrat, Conservative, Ukip, Green. All are competing on the national stage for our vote and a potential place in a coalition government, the likeliest outcome on Friday morning as no party will achieve the magic 326 seats. And there is the other choice – don’t bother voting at all. Comedian and general all-round nuisance Russell Brand has been telling anyone who will listen – young people mostly – that the public shouldn’t vote because it’s a complete waste of time. He’s since changed his mind. One recent poll suggested that as many as one in five of those who intend to vote are still undecided. How this group unravels over the next 24 hours will determine the result. Voting in a general election is complex. On the one hand you are effectively voting for the next prime minister. And Labour and the Conservatives have tried to use this by telling voters that their parties are the only possible choice. It’s Miliband versus Cameron. But you are also voting for a party. A party with a host of promises which may not live up to scrutiny in the hard light of coalition negotiations. Who could forget the Lib Dem promise on tuition fees? Thirdly, however, you are also voting for a person. And this is perhaps an often forgotten part of national elections. The ban on lamppost political posters which for decades told us all at least the surname of the candidate for each party hasn’t helped in this regard. How many people will go into the voting booth tomorrow without even knowing the name of the candidate they will vote for? A large number, we wager. They will shout Labour or SNP with conviction but know next to nothing about the individual on the ballot paper. This is a problem as ultimately we are represented at Westminster not by parties but by people. Individuals who (hopefully) live in your area, who understand local concerns, and who know the issues faced by residents and businesses. So when you are voting tomorrow, ask yourself whether your preferred candidate would be a good constituency MP? Would they work hard to put local issues on the national stage? And do they have the character to represent your area? If you’re not sure, why not ask them when you arrive at the polling station? And if you think this seems a minor point, cast your mind back just a few years to the MPs’ expenses scandal when the widespread misuse of allowance and expenses exposed the true character of so many of our elected members. Some will even consider whether it is right to oust a strong local MP because of a national issue. Is it right to vote against Ian Murray in Edinburgh South because you don’t like Ed Miliband? Or sensible to vote against Mike Crockart in Edinburgh West because you are disappointed with Nick Clegg? This paper would never presume to tell our readers how to vote. We remained resolutely neutral during the referendum campaign and will continue to do so. Our role is to be at the centre of the debate around all the issues affecting Edinburgh and the Lothians; to bring balanced news coverage together with a mix of strong opinions in the comment section. However, we do suggest that rather than simply voting on the colour of rosette, that all readers consider the individual too. When the going gets tough, you just might need your MP to stand up against that new road or housing development or to tackle the scourge of antisocial behaviour.